Strauss' Serenade (Ständchen) from his 6 Lieder, Op. 17 has been arranged for viola solo and piano by the world-famous violist Donald McInnes, who held a professorship at the University of Southern California from 1985 to 2014 and is known in virtually every corner of the artistic world for his appearances with major orchestras, recitals, chamber music participation, and numerous master classes. Strauss composed his Op. 17 songs to poems by Adolf Friedrich von Schack between 1885 and 1887. During this period Strauss became the conductor of the Munich Court Opera. His early experience in the opera house influenced him not only as an opera composer, but also as a composer of lieder. Strauss' songs often have an operatic sweep about them, as well as a clear sense of climax and dramatic pacing. The Serenade from his Op. 17 songs is no exception, with its sweeping solo line and shimmering piano part. 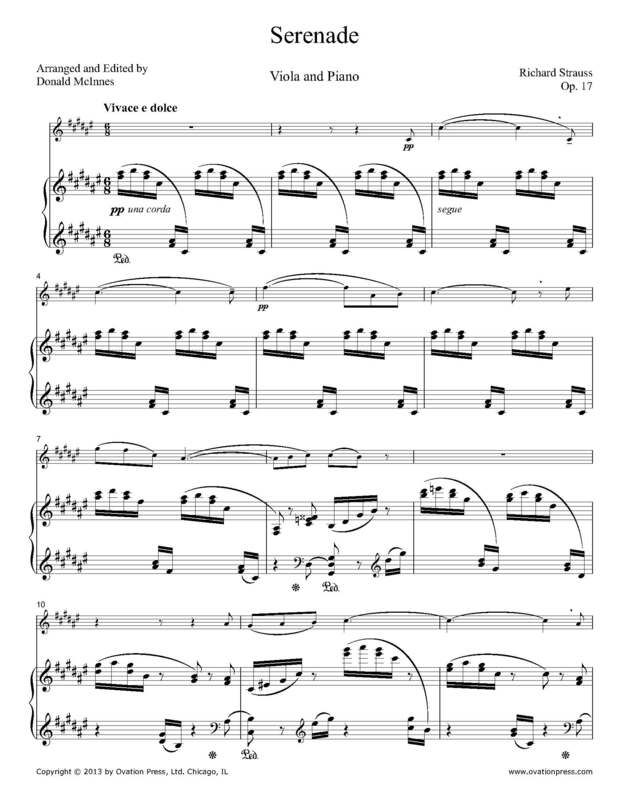 Download and print the score today to gain access to this expertly edited arrangement of Strauss' Serenade (Ständchen), Op. 17, No. 2 for viola and piano! Um keinen vom Schlummer zu wecken. Ein Blatt an den Büschen und Hecken. Nur leise die Hand auf die Klinke gelegt. mir in den Garten zu schlüpfen. Bach Und duften im Schlaf, nur die Liebe ist wach. Hoch glühn von den Wonnenschauern der Nacht. So as to wake no one from sleep. A leaf on bush or hedge. Just lay your hand softly on the doorlatch. To steal to me in the garden. Fragrant in sleep, only love is awake. Shall glow from the wondrous passions of the night.